Think of all the things you will gain from trying WonderSlim diet starter kits… Even if you do not manage to lose all pounds expected, think of the new mindset on eating you will gain. WonderSlim Diet Kits are now available in 2-week and 4-week sizes with 3 different package types each – Basic, Core and Premium. Save 10% off individual meal price. You receive 56 servings (4 WonderSlim meals per day) for only $8.63 a day. 2 week weight loss diet kit is the best trial/choice for starters determined to lose weight with these delicious and portion-controlled meal replacements. The BASIC kit provides everything you need to get your weight loss journey started. This kit includes everything you need to be successful weight loser, including all of your WonderSlim Meal Replacements, Protein Supplements and Bars. You’ll receive Meal Replacements, Breakfasts, Lunch Items, Snack Bars, Desserts, and more, plus separate Basic Meal Plans for men and women, Lifestyle Guide, Maintenance Plan, Food Diary, Food Shopping List and 20 oz. WonderSlim Blender Bottle. Order WonderSlim Basic 2 Week Diet Kit with our discount offer – you get 10% OFF. Save 12% off individual meal price. You receive 70 servings (5 WonderSlim meals per day) for only $10.11 a day. 2 week weight loss diet kit is the best trial/choice for starters determined to lose weight with these delicious and portion-controlled meal replacements. The CORE kit provides everything you need to get your weight loss journey started. This kit includes everything you need to be successful weight loser, including all of your WonderSlim Meal Replacements, Protein Supplements and Bars. You’ll receive Meal Replacements, Breakfasts, Lunch Items, Snack Bars, Desserts, and more, plus separate Core Meal Plans for both Men and Women (1000-1200 calories for Women, 1500-1700 calories for Men), Lifestyle Guide, Maintenance Plan, Food Diary, Food Shopping List and 20 oz. WonderSlim Blender Bottle. Order WonderSlim Core 2 Week Diet Kit with our discount offer – you get 12% OFF. Save 15% off individual meal price. You receive 96 servings (7 WonderSlim meals per day) for only $12.81 a day. 2 week weight loss diet kit is the best choice for dieters determined to lose weight with these delicious and portion-controlled meal replacements. The Premium kit provides you a short term weight loss solution and a great way to get your weight loss journey started. This kit brings you all you need to be a successful weight loser for 2 weeks, including all WonderSlim Meal Replacements, Protein Supplements and Bars. You’ll also receive WonderSlim Multi Vitamins, Breakfasts, Lunch Items, Snack Bars, Desserts, etc. ; Plus separate Premium Meal Plans for Men (1500-1700 calories) and Women (1000-1200 calories); Lifestyle Guide (Exercises, Nutrition Info, Behavior-Modification Techniques, Maintenance Plan); Food Shopping List, 20 oz. Blender Bottle and Food Diary. Order WonderSlim Premium 2 Week Diet Kit with our discount offer – you get 15% OFF. Save 16% off individual meal price. You receive 112 servings (4 WonderSlim meals per day) for only $7.13 a day. 4 week weight loss starter-kit provides you with everything you need to lose weight using our delicious, portion-controlled meal replacements. WonderSlim meal plans are nutritionally designed to meet the weight loss needs for BOTH Women and Men; providing 1000-1200 calories/day for Women, and 1500-1700 calories/day for Men. 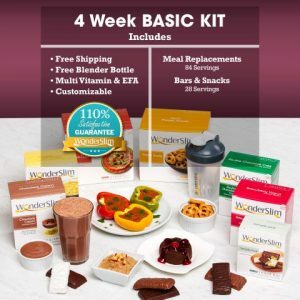 Your Basic 4 week kit includes all of your WonderSlim Meal Replacements (15 grams of protein per serving) and Bars & Snacks (10-12 grams of protein per serving), needed to follow the meal plan. You’ll receive Meal Replacements and Snack Bars plus a Daily Meal Plan, Lifestyle Guide, Maintenance Plan, Food Diary and Food Shopping List. Order WonderSlim Basic 4 Week Diet Kit with our discount offer – you get 16% OFF. Save 18% off individual meal price. You receive 140 servings (5 WonderSlim meals per day) for only $8.39 a day. Eat Every 2-3 Hours and don’t waste time and efforts on counting calories! With WonderSlim you know what you are eating each day at every meal to reach your goal. And the best of all is you’ll never be hungry! WonderSlim meal plans are nutritionally designed to meet the weight loss needs for BOTH Women (providing 1000-1200 calories per day for Women) and Men (providing 1500-1700 calories per day for Men). Your Core 4 week kit includes all of your WonderSlim Meal Replacements (15 grams of protein per serving) and Bars & Snacks (10-12 grams of protein per serving), needed to follow the meal plan. You’ll receive Meal Replacements and Snack Bars plus a Daily Meal Plan, Lifestyle Guide, Maintenance Plan, Food Diary and Food Shopping List. Order WonderSlim Core 4 Week Diet Kit with our discount offer – you get 18% OFF. Save 20% off individual meal price. You receive 196 servings (7 WonderSlim meals per day) for only $11.09 a day. Your Premium 4 week kit includes all of your WonderSlim Meal Replacements (15 grams of protein per serving) and Bars & Snacks (10-12 grams of protein per serving), needed to follow the meal plan. You’ll receive Meal Replacements and Snack Bars plus a Daily Meal Plan for both Women (providing 1000-1200 calories per day for Women) and Men (providing 1500-1700 calories per day for Men), Lifestyle Guide, Maintenance Plan, Food Diary and Food Shopping List. Order WonderSlim Premium 4 Week Diet Kit with our discount offer – you get 20% OFF.